The Israelites have been delivered out of Egypt. While there were great things God did for them like the crossing of the Red Sea and the destruction of the Egyptian army right behind them, they are captives in Babylon now. Isaiah foretells their deliverance and refers to even greater events. The redemption of sinners by Christ, the conversion of the Gentiles, and the recall of the Jews, are described here. All that is to be done to rescue sinners, and to bring the believer to glory, is little, compared with that wondrous work of love, the redemption of man. What do we learn from the past and why is it so important not to forget the past? What happens when we dwell on things that have already happened? Both good things and bad things? How does the past help us get through the present problems of life? Why is the hope in a better future so important to each of us? What do we miss out on if we dwell too much on the present or the future? 4 though I myself have reasons for such confidence. If someone else thinks they have reasons to put confidence in the flesh, I have more: 5 circumcised on the eighth day, of the people of Israel, of the tribe of Benjamin, a Hebrew of Hebrews; in regard to the law, a Pharisee; 6 as for zeal, persecuting the church; as for righteousness based on the law, faultless. 7 But whatever were gains to me I now consider loss for the sake of Christ. 8 What is more, I consider everything a loss because of the surpassing worth of knowing Christ Jesus my Lord, for whose sake I have lost all things. I consider them garbage, that I may gain Christ 9 and be found in him, not having a righteousness of my own that comes from the law, but that which is through faith in Christ—the righteousness that comes from God on the basis of faith. 10 I want to know Christ—yes, to know the power of his resurrection and participation in his sufferings, becoming like him in his death, 11 and so, somehow, attaining to the resurrection from the dead. 12 Not that I have already obtained all this, or have already arrived at my goal, but I press on to take hold of that for which Christ Jesus took hold of me. 13 Brothers and sisters, I do not consider myself yet to have taken hold of it. But one thing I do: Forgetting what is behind and straining toward what is ahead, 14 I press on toward the goal to win the prize for which God has called me heavenward in Christ Jesus. Passover is near, and so too is Jesus’ “hour” (see 13:1). He spends time with Mary, Martha, and Lazarus soon after the pivotal scene of Lazarus being brought back to life (11:1-44). That is the “sign” that brings many to believe in Him (11:45; 12:9-11), many to flock to Him (12:17-19), and others to plot his death (11:47-53). When Jesus mentions his burial in 12:7, this confirms that his end is coming. Yet Lazarus’s presence at the table confirms that death does not speak the final word. Jesus creates a connection between His and His burial in 12:7. Jesus suggests that Mary’s keeping the perfume in her possession and using it on Him now have consequently achieved a greater, more meaningful purpose that she perhaps originally intended, thus announcing the nearness of Jesus’ death and preparing for His burial. The sweet smell of Mary’s perfume counters the stench of Lazarus’s tomb (11:39). Life and death, wholeness and corruption remain in contrast. 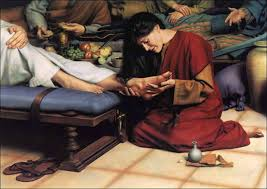 Mary’s wiping of Jesus’ feet reveals her as a model disciple, for the washing and wiping of feet foretells the time when He will wipe the feet of his disciples (13:5). We have already been told (6:70-71) that Judas is “a devil,” but John chooses this point to reveal him as a thief (compare 13:29). This creates a clear contrast between Judas and Mary. He is false; she is true. He is greedy and self-serving; she is generous devoted. The whole scene seems to offend Judas. The question is does he regret losing the chance to pilfer from the 300 denarii, or is Mary’s lavish love too disturbing to watch? We can understand the economic and charitable logic beneath Judas’s criticism, but we should also recognize that it resembles a rigorous, unyielding piety that cannot stomach a wild love like Mary’s. Acts of true grace and love regularly get slandered as being deviant behavior. Now the Apostle Paul tells us that the work of religion is to no purpose or for no benefit, unless our heart is in it. To gain it from it we must worship God in the strength and grace of the Holy Spirit. We are to rejoice in Christ Jesus, not just in mere outward enjoyment. Paul says he had every reason to trust in the flesh as anyone. This is what he counted on while a Pharisee. Now he considers all these things to be a loss, compared with the knowledge of Christ, by faith in His person and salvation. Paul speaks of all worldly enjoyments and outward privileges which sought a place with Christ in his heart. He had suffered the loss of all such privileges to be a Christian. It would be, however, his true knowledge of Christ that changed him. The believer will always prefer Christ, knowing that it is better for us to be without all worldly riches, than without Christ. Before God, we are guilty. There is a righteousness provided for us in Jesus Christ, and it is a complete and perfect. None can gain benefits from this righteousness if we trust in ourselves. Faith is the appointed means of applying the “saving benefit.” It is by faith in Christ’s blood. We are made to die with Christ, when we die to sin, as he died for sin; and the world has crucified us by the cross of Christ. The apostle Paul was willing to do or to suffer any thing, to obtain glorious resurrection promised to him. This hope and this prospect carried him through all difficulties of his work. He did not hope to attain it through his own merit and righteousness, but through the merit and righteousness of Jesus Christ. What smells of your past do you still find pleasurable? Offensive? How were the circumstances of those experiences influencing either your pleasure or displeasures with those smells? Why are some people angered by scenes of extreme love and generosity? Our failures act like an anchor. How can we help people break that chain and free themselves from negative past experiences? Why is it difficult to focus on the future? What are your secrets to finding enough energy to continue the “fight” toward Christ? How do each of the areas below serve to inhibit and/or strengthen our faith in Christ? 1. Foil – Legalism – excessive adherence to law or formula. 2. Face – Faults – taking responsibility for an accident or misfortune. 3. Forget – Failures and Successes – learning from a prior success and failure experience. 4. Focus – Future – existing or occurring at a later time. 5. Fight – Till the Finish Line – to contend against in or as if in battle or physical combat.